Monogram school backpacks. Classic and bold mini striped pattern backpack. Attractive orange, navy and white. Neutral design can be used for guys or gals, for toting around town, meeting up with friends or school. This durable backpack will meet all your needs. Lightweight with a wipeable exterior and roomy interior. Front zip pocket for easy access to small items, main body has zipper closure and padded backpack straps. 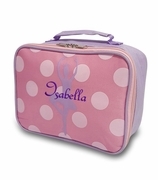 A matching lunch tote is available for a back to school set, search item MS-23532. Personalized and embroidered striped backpack measures 17"H x 13"W x 5" across bottom. Zipper closure.